You have downloaded the new avast! Mobile Security version 3. You now have a powerful tool to protect your mobile phone from malware, as well as anti-theft features in case your phone is lost or stolen. But you may be wondering, "How do I use this mobile security software to its full power for maximum benefit? What can I expect from the new version?" On demand scanning is a preventive feature. To get rid of bad or infected files that can rest in your Android and SD Card (storage), scan your phone with the latest virus definitions. You can set avast! Mobile Security to run at night, when you’re sleeping and charging your phone. You love to install apps in your phone, don’t you? After some time, your home manager will show a lot of icons. Why would I need an app manager if the phone already has one, you might be thinking? Because with avast! App manager you can see your running apps, check their permissions, if they display ads, and if you have a rooted device, you can even block the app access to some of your networks, saving you money with your data plan. avast! Mobile Security has a powerful ad detector. You can see up to 7 categories of possible ads, from geotracking to showing ads in your phone to collecting personal information and data. 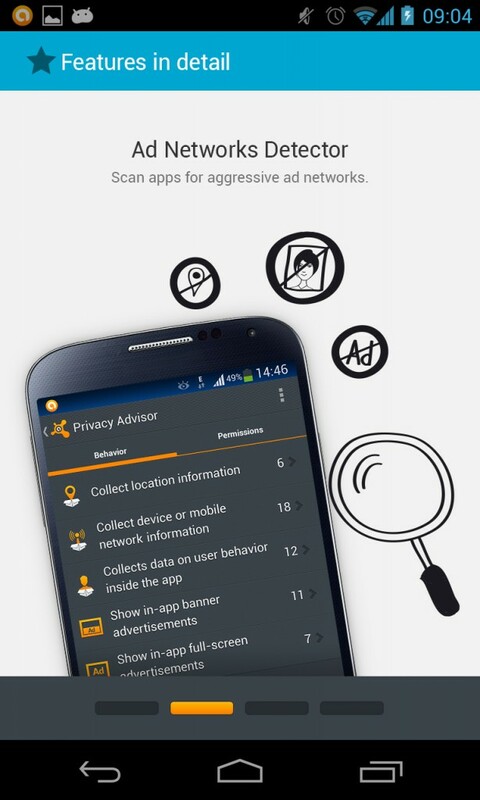 When you install an app, AVAST will automatically warn you about bad behaviors and you could act immediately to get rid of annoying ads. Relax! You can configure AVAST to warn based on your own criteria. For rooted phones and tablets, you can block a specific network access (WiFi/Data/Roaming) for the app being installed. This is a new feature! 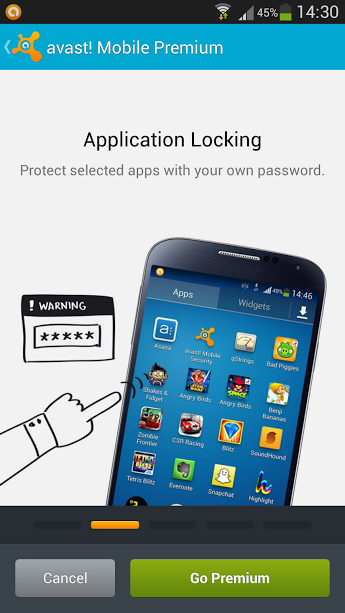 App Locker allows you to lock any app or device configuration to be changed. It’s very flexible: You can set a pin, a password, or a pattern to unlock the app, and it can even be time sensitive. You can lock it when you know your phone is in danger or possibly lost and when in your possession, you can release the normal use of the apps so you're not bothered with a pin. You probably already know it, as it one of the reasons why millions of users are using AVAST to protect their phones. The major problem nowadays is the fear to get lose your phone and have your personal info and data misused. Hackers can do damage to your reputation by having access to your contacts, social media accounts, etc. Anti-theft can be remotely monitored by SMS or using your dedicated portal my.avast.com. Don’t wait until it’s too late: Save your data and you will lost only your device and save a lot of headaches. Now avast! Mobile Security comes with a Backup app. In the free version, you can back up your contacts, call logs, SMS, and image files. If you want the full power of the premium version, you will also able to back up and protect your audio files, videos, and even the apps. In rooted devices, the apps and games data (settings) could also be protected. If your phone get lost or stolen, you can restore all your personal stuff stored in Google Drive free storage. Now you know how to access the hidden power of avast! Mobile Security. If you like the avast! Mobile Security road map, please tell others about it so they can be protected too.